The above graph on interchangeable lens camera shipment December data from CIPA: While the market for interchangeable lens cameras and lenses is down, it’s been the digital compact market (point & shoots) which has suffered most, although the carnage of the last five years seems to be levelling off. Holding up the interchangeables market is the mirrorless segment, which according to more detailed CIPA figures, in fact increased year-on-year sales compared to 2017 by 1.4 percent in volume and 23 percent in value. So while compacts are falling way behind, DSLRs are falling behind as well, which has resonances with that old joke about the two hikers being pursued by a bear. DSLR’s still outsell mirrrorless cameras by 6.62 million (61.5%) to 4.14 million (38.5%), but in dollars terms, the value of the two segments is about equal. Canon recently said they expect two more years of market shrinking until market stabilizes. Are you surprised? I'm not. 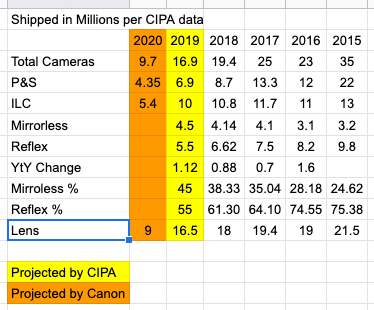 The table above shows the CIPA sales data from 2015-2018, CIPA's projected camera sales for 2019 & Canon's projected camera sales for 2020. 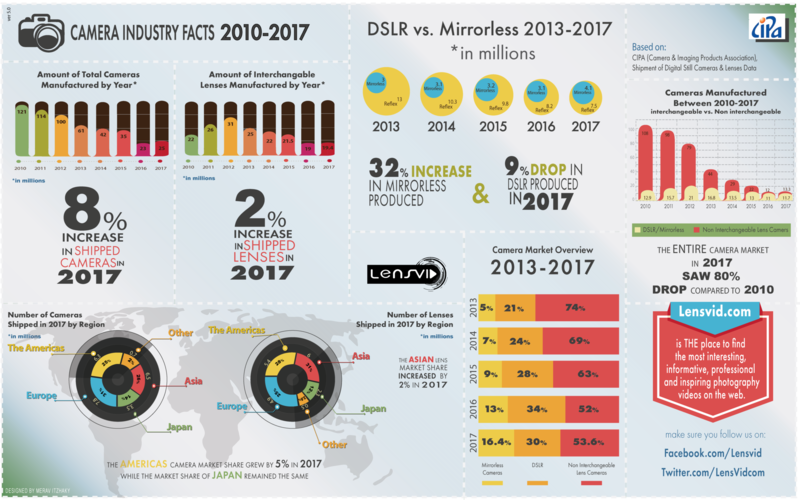 Based on the CIPA 2019 & Canon 2020 sales figure I am fairly confident that companies like Canon & Nikon may not release any more new DSLR (Reflex) models anymore before July 2020 and instead put in all their R&D money into more mirrorless camera bodies and lenses that are equal or exceed the features, capability and accuracy of DSLRs sold today. Canon CEO also noted mirrorless camera sales aren't significantly adding to its bottom line, but are instead significantly eating into the sales of DSLRs. If any R&D capital is going to cannibalize your money makers during your current product's mid-cycle then you may as well just release new generation of mirrorless camera models at the end of the product cycle of your DSLRs. Personally, I would prefer 1 more generation of DSLRs within the next 17.5 months but market forces may force the 1D X Mark II, 5D Mark IV, 5Ds / 5Ds R, 6D Mark II and 7D Mark II to be the last full frame and high end APS-C DSLR models to be developed.